Long Awaited New Suzuki GSX-R1000 For 2017! Suzuki has been very silent since 2008 gave the entire powersports industry a serious beatdown... but we're finally hearing a heartbeat again with the introduction of a new big GSXR (even if it looks unchanged from when it was previewed a year ago). Several non-flagship models are also new or significantly reworked for 2017. Suzuki Motor Corporation has unveiled five new motorcycle models for the overseas market including Europe and North America for 2017 at the INTERMOT International Motorcycle, Scooter and Bicycle Fair held in Cologne, Germany from 4 to 9 October, 2016. In 2017, Suzuki will introduce the all-new GSX-R1000/GSX-R1000R supersport bikes, as well as the newest and the smallest displacement model in the series, the GSX-R125, plus, the second model in the street sportbike series, the GSX-S750. The all-new V-Strom 1000/V-Strom 1000XT and V-Strom 650/V-Strom 650XT adventure bikes are also unveiled for 2017. In addition to the above five models, four more models are to be unveiled at the EICMA2016 (Milan Show), which will be held in Milan, Italy in November. Suzuki is scheduled to introduce a total of nine new models in 2017. Comprehensively enhanced for the first time in eight years, the sixth-generation of Suzuki’s flagship supersport bike GSX-R1000 and its advanced version GSX-R1000R have been evolved further by incorporating technologies earned in MotoGP. 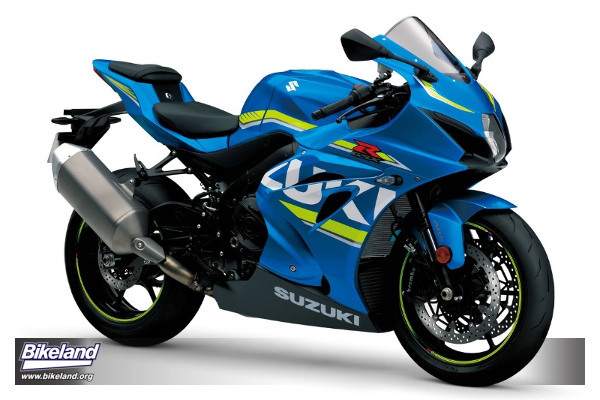 The features of GSX-R series, “Run. Turn. Stop.”, which are the fundamental design of harmonizing the engine and chassis, are thoroughly reviewed and balanced in high dimension. - Newly-developed 999.8cm3 in-line four-cylinder engine has adopted a new system called the Broad Power System, which incorporates technologies developed in MotoGP. The Broad Power System is a technology that strikes a balance between enhancing output in the high rpm range and low-to-mid speed range output. It is composed of four systems: 1. Intake VVT (variable valve timing); 2. Electronic throttle body; 3. Valve train system; and 4. Exhaust pressure tuning valve. - Meets the new Euro4 emission standards (for European specification). - Newly-developed frame has reduced width for enhanced aerodynamics, and is 10% lighter with optimized rigidity. - Improved cornering performance and manoeuvrability thru changing the engine’s cylinder angle and shortening the distance from the front axle to the swingarm pivot centreline. - Completely redesigned cowling with smaller frontal projected area for large improvement in aerodynamics. - Brembo radial mount front brake calipers are matched with T-drive brake discs tuned for production models, which produce more efficient transfer of stopping power. - ABS variant (ABS is standard equipment for GSX-R1000R) is equipped with Motion Track Brake System, which reduces rear-wheel lift during very hard braking by employing the IMU (Inertial Measurement Unit). Plus, the system equipped on the GSX-R1000R also optimizes front brake pressure when the front brake is applied, based on the leaning angle of the motorcycle to suppress reduction in front tire grip. - Motion Track Traction Control System allows the rider to select 10 different levels of traction control intervention, depending upon road or racetrack conditions as well as personal preference and experience level. - Systems such as Low RPM Assist, which raises engine rpm in starting and in low rpm range, and Suzuki Easy Start System, which enables the rider to just one-push the starter instead of press-holding it to start the engine, are adopted. - Launch control system is adopted for the first time on Suzuki production models (excluding competition models). The system makes it easier to get a good start by helping it reduce the chance of a wheelie by automatically limiting engine rpm and optimizing torque delivery. - Quick shift system is adopted for the first time on Suzuki motorcycles, which enables quicker and smoother shift changes. - Standard equipment of racing-developed, high performance Show Balance Free Front Fork and Balance Free Rear Cushion Lite. GSX-R125 is a new GSX-R model that extends its appeal and allows beginner and younger riders to enjoy the special GSX-R experience by installing a 124cm3 engine (the smallest displacement engine in the series) onto a light and compact chassis. The water-cooled four-valve single-cylinder DOHC engine realizes high performance that deserves the name of GSX-R. It has ABS as standard equipment, and adopted a keyless ignition system and the Suzuki Easy Start System. The sporty styling inherits the GSX-R design. GSX-S750 is the second GSX-S series model following the GSX-S1000, which has been earning high appraisal for its sharp throttle response and manoeuvrability since it was unveiled at the previous INTERMOT in 2014. GSX-S750 has adopted features common to the series such as a crouching styling design, three-level traction control, and radial mount front brake calipers. Plus, it is equipped with petal-type front and rear brake discs and tapered handlebars. Moreover, it has standard equipment of Low RPM Assist and Suzuki Easy Start System, and an offer of ABS variant. High output 749cm3 in-line four-cylinder engine has been pursued to realize uplifting acceleration derived from the GSX-R750 and user-friendliness on public roads. It meets the Euro4 emission standards (for European specification). V-Strom 1000 and V-Strom 1000XT are comprehensively enhanced models of the Sport Adventure Tourer for comfortable riding in various situations of long-distance touring. It meets the Euro4 emission standards while maintaining the characteristic of the 1,037cm3 V-twin engine (for European specification). The styling design has undergone a major change giving the V-Strom a hint of Suzuki’s adventure bikes that started from the 1988 DR750S. It has enhanced comfort with the knuckle covers and under cowling as standard equipment, and the length of height and angle adjustable wind screen raised by 49mm. Plus, safety and convenience are enhanced with the newly adopted features such as the Motion Track Brake System, which enables ABS to activate also when the vehicle is leaning to either side, and automatically applies pressure to the rear brake to stabilize the vehicle when the front brake pressure rises to a certain degree; Low RPM Assist; and Suzuki Easy Start System. Wire-spoke wheel equipped V-Strom 1000XT, which has enhanced shock absorption performance in the low speed range, is newly introduced and comes with tapered handlebars as standard equipment. V-Strom 650 and V-Strom 650XT are comprehensively enhanced models of the middle displacement Sport Adventure Tourer. Installed with the 645cm3 V-twin engine common to the SV650, a model unveiled at the 2015 Milan Show, it has enhanced output and torque, and meets the Euro4 emission standards (for European specification). By adopting new features common to the V-Strom 1000 such as styling design, traction control, Low RPM Assist, and Suzuki Easy Start System, it now has unity among the V-Strom series and evolved further. The wire-spoke wheel equipped V-Strom 650XT has standard equipment of knuckle covers and under cowling.